We are located on West Ann Road in North Las Vegas between Decatur Boulevard and Valley Drive - near to the Bruce Woodbury Beltway. Call the facility for directions 702-396-0090. 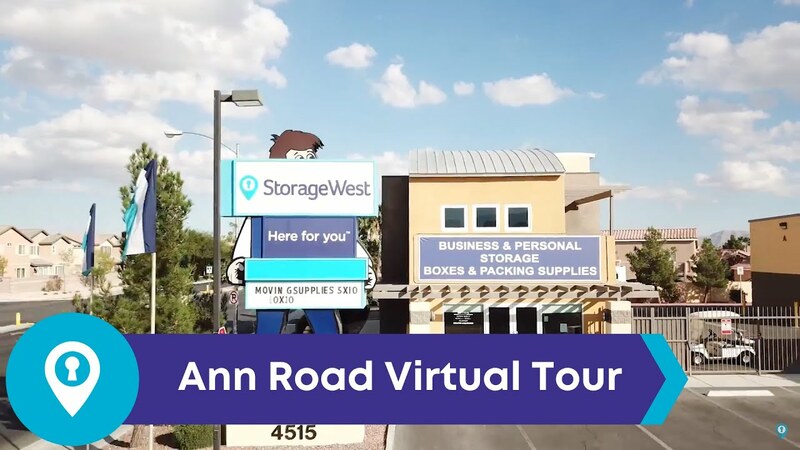 This is Storage West's North Las Vegas Self Storage location, click here to see other Las Vegas self storage locations. There are many local stores, small businesses and residential developments in our area. We also have local restaurants nearby so you can easily grab a bite to eat. The weather here can be hot in the summer, but it is really nice during the other months. Perfect for getting out and about. At Ann Road we value our community of renters. They like the fact that the property is always clean, secure and well looked after and that the staff make a real effort to help tenants with their individual requirements. I just love George and Susan, they are like family! I couldn't ask for better people to manage this place. George and the staff keep this place clean all the time. I recommend Ann Road location to anyone! What a great place to store your belongings, safe, clean and easy access to each unit. George and Susan couldn't be nicer. They really care about the facility and the customers. Every time I was on property, I subtle hello went a long way. If you or anyone in the Northwest in need of a place to store items, a truck, rv or a boat, look no further, go to Storage West and tell them Terry and Pam sent you. Thank George and Susan.